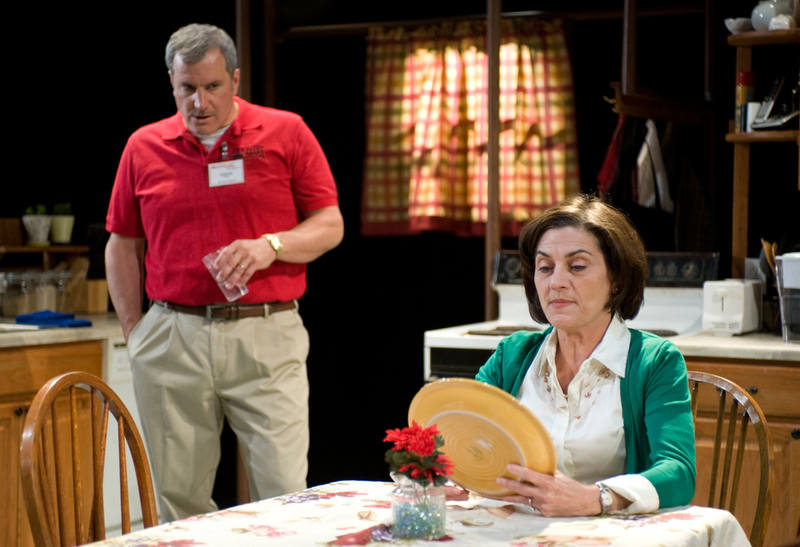 In South of Settling playwright Emily Schwend explores what happens when life does not turn out how you plan and a past tragedy leaves a family unable to move forward. The lighting in the play is subtle and fluid, delicately underscoring the action as we move through time and space. We join Kate and Irwin years after the loss of their child, awaiting the arrival of Kate's estranged cousin Amy. Afternoon sunlight spills into the house; bright, clear and fresh. Yet, it does little to warm the otherwise chilly atmosphere for Amy an Randall's arrival. Even when we leave the confines of the Deckhouse home, it never completely dissolves into the background. The bright florescent light of the school and auto parts store briefly give Kate a reprieve from the past she is avoiding at home, isolating her downstage in these moments against the backdrop of the house where Amy has entrenched herself. These two women exist so close together, and yet they are separated by the gulf of time in their hearts. At night the gentle fluorescent glow of the kitchen light lifts the shadows like a veil, providing a place of refuge and warmth in a kitchen otherwise shrouded in darkness. It's here that the women find each other at their most vulnerable and are able to connect, seeing each other as humans beneath the soft halo of lamp light. In spite of their tenuous moment of connection the previous night, the women are unable to stave off their frustrations in the bright, unyielding light of day. Amy's arrival and the subsequent confrontation it causes tear open old wounds and airs grievances that should have been addressed long ago. We are left with Kate and Irwin alone in the kitchen, the same bright and fresh afternoon sunlight spilling in from the upstage windows. This time, however, there is a faint warmth that permeates the home. It's only with their feelings voiced that everyone is able to pick up the pieces and move forward; even if that means they are moving in different directions.